The Grapefruit Experiment’s music seemed improvisational in nature, and evolved organically through different movements as I watched. After a few minutes, the sound built to a unified, powerful crescendo, and sounded for a moment or so like a band endlessly holding the final chord of a song, jam-band style. But whereas it’s annoying when jam bands do such things, The Grapefruit Experiment used it to devastating effect, especially after the relative quiet of the earlier parts of their set. Rather than stopping, they moved past this crescendo and into more noise, though the latter part of their set was a bit more structured than the first few moments I heard. The clanking runs of dissonant notes she played reminded me of a time when I saw Dillinger Escape Plan and their lead guitarist was having an off night; he kept getting out-of-sync when doing his speedy, elaborate runs of single notes, instead playing a bunch of flat, off-key thuds. For The Grapefruit Experiment, though, this was the desired effect, and it mingled well with the deliberately arrhythmic percussion and oscillating bursts of treated noise. It wasn’t a conventionally musical set by any means, but nonetheless The Grapefruit Experiment gave a fascinating performance. It’s great to see that what we do is “understood.” We thank you. 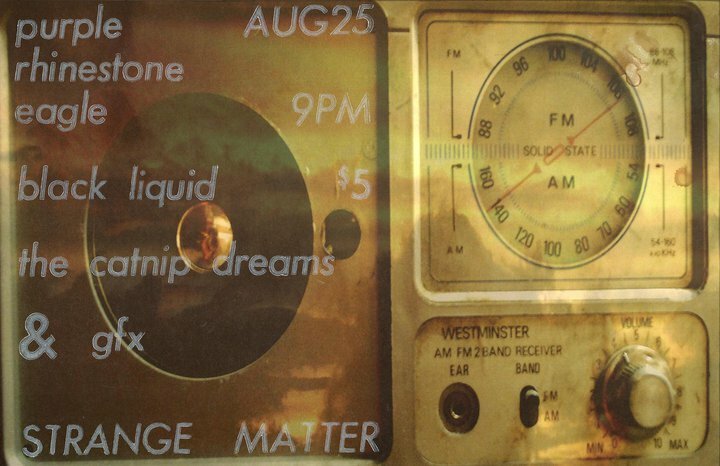 We’re really psyched about collaborating with our friend Kenneth Yates (Caustic Castle) on August 25, 2010 at Strange Matter, formerly Nanci Raygun and Twister – Richmond’s infamous punk venue on Grace Street. Come on out, RVA! GFX coordinated the second installment of the Charlottesville Bike Ensemble performance at Random Row Books on May 13, 2010. This performance supported the Petrol-Free Gypsy Carnival Tour, “a bicycle-powered music and art tour to promote peace, social justice, and a healthy planet. 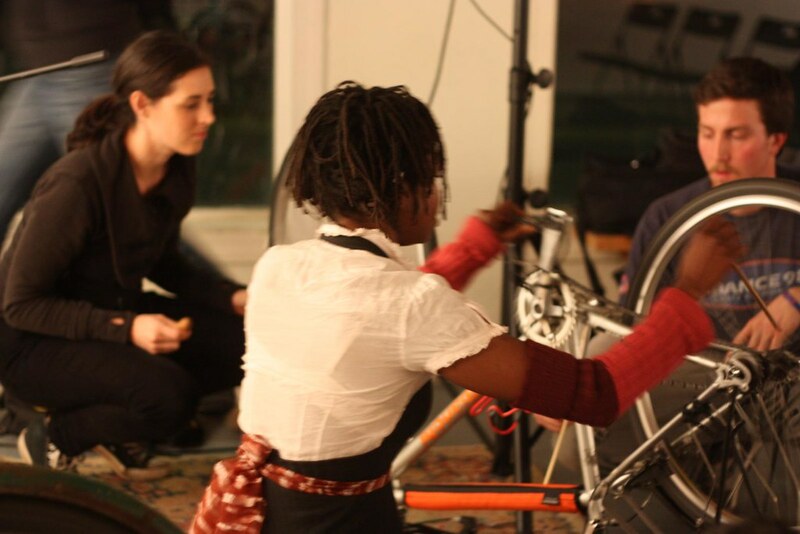 On the tour, musicians carry only the essential instruments from city to city on their bicycles.” Part of our set is recorded as a part of the documentary video of the entire Petrol-Free tour. After our Matmos-inspired beat-oriented bike noise set, we sang and dance with everyone involved in the tour. It was a beautiful night. We’re happy and honored to have participated in this collective experience. C-ville Feedback writer Andrew Cedermark interviewed me and Carey on the cover story about women in rock. We sat down with Andrew individually with the attempt to answer this age-old question within the context of Charlottesvile music: Why aren’t there more women in rock? We bring up structural issues related to culture and gender ideology. One transformative moment, she says, in that history is when “rock and roll”—a form for excited teens in dance halls—became simply “rock.” That happened when these teens grew up, and wanted something more art-related. “It became rock, which was oppositional to pop music. Pop music was more commercialized, more superficial, and more associated with women.” The sheen of pop and the rigidity of classical music took on feminine associations, and none of them fit the rock bill. As GFX, we addressed the issue at stake by recording a C-ville Feedback video session, making a statement in the expression of sound, gestures, and embodiment in our unique ways. Charlottesville bike activist Shell Stern invited me to co-organize and perform at the Kickstand Bike Zine Release Party. To fit the Audio March theme at The Bridge PAI, we decided to add a bike noise component to the event. 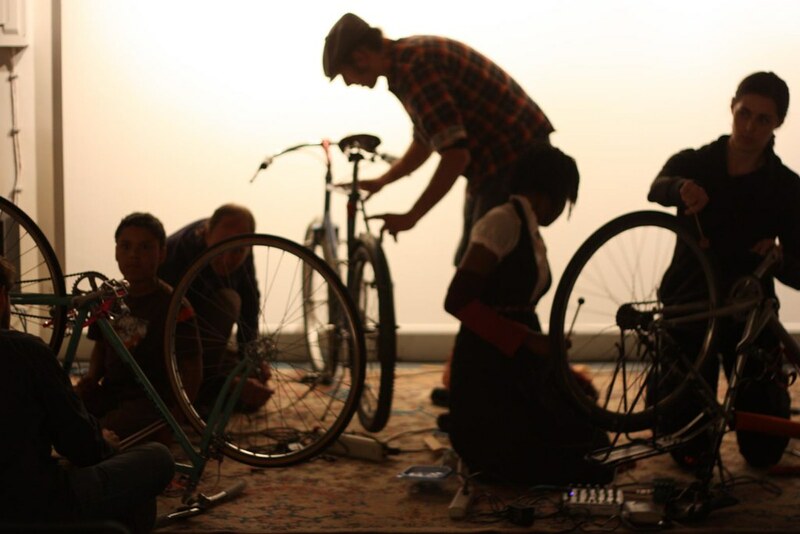 A few weeks prior to the event, I rounded up some local bike lovers to join me in the bike noise performance. At the event, the first half of our set featured me and Carey (GFX); in the second half, we were joined by Dylan Mulshine (aka Rhythm Bandit) and Ken Margolius (local bike mechanic guru!). 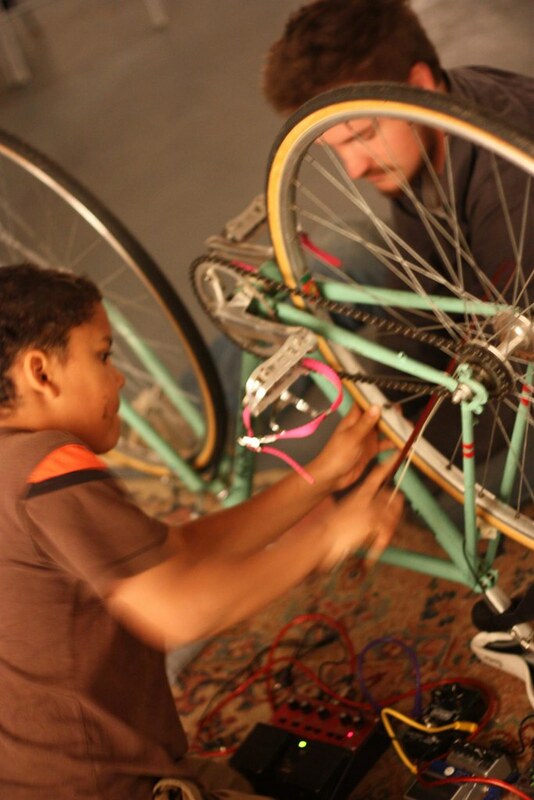 Ken brought his “most musical bike.” Dylan played percussive sounds while processing them on metallic bike components. The evening’s program also showcased zine reading, bike story telling by Secretly Y’all. It closed with a final bike noise jam involving members of the audience. A debut of the Charlottesville Bike Ensemble. Anyone in? We will probably gather again for a summer performance at Random Row Bookstore. Let me (wendy.f.hsu [at] gmail.com) know if you’re interested.